The Bible prophesied that this is how World War III would start. Thinking about world trade is a bit like thinking about your blood pressure. The subject is neither compelling nor obviously significant, so it doesn’t come to mind often. But then a blood vessel hemorrhages and your life is turned upside down. Is global trade war about to suddenly turn humanity upside down? The world trade order is currently being reconfigured in an astonishing way. This transformation is already impacting trade relations and facets of some economies. But soon it will significantly impact every national economy, every national government, and every major international relationship. The political and geopolitical ramifications will be extraordinary. First, America is relinquishing world leadership and is becoming isolationist and protectionist. President Donald Trump’s motto is “buy American, hire American.” To many Americans, this sounds terrific; but to foreign leaders, the thought of the world’s most important economy reducing imports is alarming. America is reassessing established trade relationships, seemingly abandoning globalization, and canceling trade deals. President Trump scrapped the Trans-Pacific Partnership, called nafta one of the worst deals in history and hinted at reworking it, and threatened to impose tariffs on imports from Germany, China and Mexico. Second, Britain’s departure from the European Union has compounded the sense that globalization is over and that it’s now every man, or nation, for himself. Brexit has also created enormous uncertainty and anxiety, especially in Europe. What does Britain’s departure mean for the future of the EU? Will European nations have open access to UK markets? Is the UK now a competitor in global trade? These are life-and- death questions for the EU. Finally, America’s and Britain’s moves to shed their postwar roles and responsibilities and to blaze new trails—including a possible renaissance in Anglo-America relations—have given other world powers, especially Europe, opportunity and license to do the same. The upheaval in global trade and commerce has caused enormous uncertainty and anxiety. More and more it is sparking competition and hostility. The world, as daily news headlines now routinely declare, appears to be entering a period of trade war! When it comes to trade, no nation has more at stake than Germany. Berlin quietly sits at the heart of global trade. It has the fourth largest economy in the world, is the world’s third biggest exporter, and is the engine that drives Europe economically. As Spiegel Online put it, “No other large economy is more reliant on the free exchange of goods and services, on border-free trade and barrier-free exports, than the German economy” (January 28). Mr. Trump’s views on trade, according to Spiegel, are a “dangerous cocktail for German industry.” This is not hyperbole. America is the single largest importer of German goods. In 2015, it accounted for almost 10 percent of German exports. (And the UK accounted for 7.5 percent.) “Considering that 46.8 percent of Germany’s gdp comes from exports,” explained Geopolitical Futures, “the importance of the U.S. to Germany’s export machine should not be underestimated” (February 6). Even a marginal drop in U.S. demand for German goods—and the drop, in the event of a 35 percent tariff, would surely be more than marginal—would have a massive impact on the German economy. “It is becoming apparent that Trump’s presidency represents a break in the transatlantic relationship, the kinds of which hasn’t been seen since World War ii,” explained Spiegel. Some looking at this development see Germany and Europe as innocent victims of Donald Trump and Brexit. Germany’s media are doing a marvelous job at selling this narrative. But Germany isn’t a poor, helpless victim. On the contrary, all the uncertainty and tension is giving Berlin an opportunity to develop new trade relationships, to act more aggressively, especially toward the U.S., and to assume a greater leadership in global trade and commerce. The international community in general dislikes President Trump and his vision for America. One consequence is that many nations—European states especially, but others worldwide—are beginning to look to Germany as the new America! The world is rallying behind Berlin as it stands up to Mr. Trump, and we can expect this trend to continue. It’s still early, but Germany is already gearing up for a fight. In January, when asked about Mr. Trump’s threat to put a 35 percent tax on some German imports, Finance Minister Wolfgang Schäuble told German public broadcaster zdf: “I also want to point out that currently American companies don’t have to tax their gains which they make outside of the U.S. That means that hundreds of billions of untaxed gains, of great American companies, rest in a tax oasis” (Trumpet translation). Germany and Europe have long resented facets of America’s business culture and have been openly hostile to companies like Facebook and Google. The Financial Times reported that Europe was putting together an army of lawyers to battle America over a proposed border tax: “The EU and other U.S. trading partners have begun laying the groundwork for a legal challenge to a U.S. border tax proposal in a move that could trigger the biggest case in World Trade Organization history” (February 13). Germany and Europe might have been shocked by some of President Trump’s decisions, but they’re not sitting around feeling sorry for themselves. On the contrary, they are exploring new partnerships and opportunities and preparing for greater competition with America. As Spiegel wrote, Germany is thinking: “Is it better to remain composed and unperturbed, relying on rationality, on the strength of decades of ties and on the rules of the global economy? Or would it be better to prepare countermeasures, search for new allies in, for example, Asia or perhaps even to take advantage of the vacuum that is being created?” (op cit; emphasis added throughout). This search for partners is mainly taking place in Asia. In January, German Foreign Minister Sigmar Gabriel said Germany should work “quickly” to form a new Asian strategy. Writing in the Financial Times on February 2, Alexander Stubb, former Finnish finance and foreign minister, called for Europe to champion free trade in the global American vacuum. Europe, he wrote, must be at the vanguard of global trade outreach to Asia. A February 14 Politico article reported on the “peculiar alliance” forming between Germany and China: “The partnership is partly intended to signal to Washington that, in the face of the White House’s rising economic nationalism, deals without the U.S. will become more important, shrinking its influence on the global stage.” In an interview with the New York Times, Jeroen Dijsselbloem, president of the Eurogroup, discussed Europe’s shift in focus. “We’ve always said that America is our best friend,” he said, but if that is “no longer the case, if that’s what we need to understand from Donald Trump, then of course Europe will look for new friends” (January 30). Dijsselbloem is right. Trade relations between Europe and Asia have grown significantly in the last two decades. EU imports from China increased 11-fold from 1995 to 2013. Exports going the other way increased eight times over the same period. From 2010 to 2014, Chinese investments in Europe rose from $6 billion to $55 billion. China invested nearly as much money in Europe in 2014/2015 as it did in the seven years from 2008 to 2014. In early 2016, as China’s President Xi Jinping stated at the time, 1 out of 3 containers at Germany’s Hamburg port was from China. Today there are more than 5,000 German companies in China, and almost 1,000 Chinese companies in Germany. This is a strong foundation for improved trade relations between Europe and Asia. Jörg Wuttke, president of the European Union Chamber of Commerce in China, told Politico: “The emergence of ‘Trumponomics’ has opened a window for us to renegotiate” relations with China. While a change in free trade with America is unwelcome, he noted, “The prospect of a more equitable trade relationship with Beijing could be a big silver lining for Berlin” (op cit). Germany and Europe are not only looking east. In February, with tensions rising between Mexico and America, the EU announced that it had agreed to speed up negotiations with Mexico to modernize their existing free-trade pact. There is also a strong push to improve trade relations between Europe and Latin and South America. Can you see what is happening? Europe and Asia are actively seeking improved economic relations. In the process, these nations are also positioning themselves to undermine and oppose America and Britain. 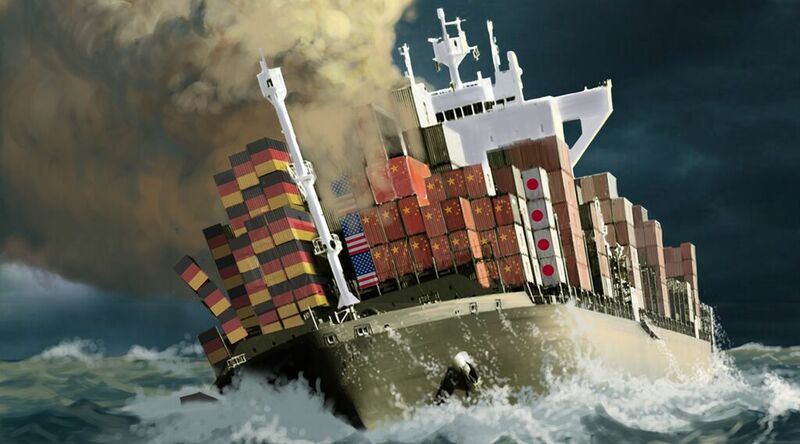 We are in the early stages of a massive global trade war! Some believe increased global trade is a path to peace. They think that by interlocking multiple economies and increasing interdependency, nations have a vested interest in preserving the peace. This sounds reasonable, but what does history show? “Does trade increase or decrease the likelihood of conflict?” historian Samuel Huntington asked. “The assumption that it reduces the probability of war between nations is, at a minimum, not proven, and much evidence exists to the contrary” (The Clash of Civilizations and the Remaking of World Order). The line between cooperation (globalization) and competition (trade war) is fragile. The free flow of goods, services and people between nations can produce peace, but it lasts only as long as all sides benefit. If one nation begins to suffer—especially if its distress is a result of the other nations’ success—then tension, resentment and animosity fester. Eventually, the disadvantaged will defend their interests. Two toddlers will play happily and share their toys as long as both are satisfied. But when one child grows bored with his toy, or it breaks, what happens? He lunges for the other child’s toy—who, naturally, doesn’t want to relinquish it. “It’s mine!” he screams. The scene transforms from peaceful cooperation to fierce competition in a moment. It’s much the same with globalization: Everything is great as long as all parties benefit. But when one senses it is being treated unfairly, partners can quickly become competitors; allies can become enemies. The Trumpet and its predecessor, the Plain Truth, agree: Globalization can quickly spiral into political and even military conflict. Will history repeat? Bible prophecy answers with a resounding yes. A Euro-Asian ‘Mart of Nations’! The Prophet Isaiah forecast a massive global trade network in the end time and said it would revolve around a German-led European superstate. You can study this prophecy in Isaiah 22 and 23. In Isaiah 23:1, China is called by its ancient name, Chittim. The same verse calls the German-dominated European combine Tyre, which was a major economic power extant at the time the prophecy was written. In this prophecy, the end-time Tyre is shown to be in a trade relationship with China and other Asian peoples. The mention of the sea (verses 2, 4, 11), oceans (“great waters,” verse 3), ships (verses 1 and 14), and seaborne merchant traffic (verse 8) indicates this is a trade alliance. Verse 3 calls this a “mart of nations.” Mart means emporium, trade or merchandise. Verse 13 mentions Italy (Chaldea). Italy is here depicted in association with Germany, whose biblical identity is Assyria, or Asshur. Clearly, this is a prophecy about an end-time trade axis between Europe and Asia! Notice too: America and Britain are not part of this “mart of nations.” Why not? Because this trade emporium is a rival of the U.S. and Britain. It is infused with strong anti-American and anti-British sentiment. This “mart of nations” exists tocompete withAmerica and Britain! Trumpet editor in chief Gerald Flurry discusses this prophecy in his book Isaiah’s End-time Vision: “[W]e believe there may be a brief alliance between the German-led Holy Roman Empire and certain Asian powers (Russia, China, Japan—the kings of the east).” This German-led global trade conglomerate will be a “dynamic market of nations,” he states. He wrote that seven years ago! Mr. Flurry also warns that this temporary “mart of nations” is “going to besiege America, Britain and the Jewish nation.” This warning comes from a specific prophecy in Ezekiel 5. Here, God warns that the cities of America will burn with fire caused by riots and mass civil unrest. Millions of Americans will die. This violence will be inflamed by an economic siege—trade wars—inflicted by the resurrected Holy Roman Empire working in conjunction with China and other Eastern nations. The United States and Britain are going to be left out in the cold as two gigantic trade blocs, Europe and Asia, mesh together and begin calling the shots in world commerce. These nations of Israel are going to be literally besieged—economically frozen out of world trade!” Ezekiel: The End-Time Prophet by Gerald Flurry (request a free copy). We are clearly in the early stages of the trade war that precedes this siege! The siege is at the door! Ezekiel also prophesied about this temporary Europe-Asia economic alliance. The end-time prophecy of Ezekiel 27 discusses a “merchant of the people for many isles.” It foretells Germany trading with Middle East nations (verses 9-10), with Russia (verses 12-13), and with Japan (verse 14). The Apostle John delivered a similar prophecy. The theme of Revelation 17 and 18 is the seventh and final resurrection of the Holy Roman Empire. Revelation 18:3 describes the demise of this superstate, stating that “the kings of the earth have committed fornication with her, and the merchants of the earth are waxed rich through the abundance of her delicacies.” This prophecy shows that for a brief period—just before the Second Coming of Jesus Christ—a German-led Holy Roman Empire will sit at the nucleus of world trade. We have just noted three distinct biblical passages, written by three individuals at three different times, discussing exactly the same end-time event. How can you explain this incredible fact? We have been warned! And not just by Isaiah, Ezekiel and John. Here is another warning, delivered in 1971. On this occasion Mr. Armstrong specifically addressed America’s protectionist policies. “Either we start raising high tariff barriers against other countries, starting a trade war which in time will trigger the nuclear war that will destroy us—or, American workers are going to have to meet the competition of the workers in other countries, by lowering living standards. Obviously American workers are not going to choose to do the latter. And if they don’t—well, the handwriting is on our national wall” (Plain Truth, March 1971). What a profoundly prescient statement. Mr. Armstrong foresaw the exact dilemma America faces today! He did not use a crystal ball—he used Bible prophecy. And the Bible plainly shows that a nuclear World War iii will be preceded by a global trade war. In fact, Scripture is even more specific. It says that a German-dominated European power will temporarily align with China, Russia and other Asian powers to bring America down. These prophecies are being fulfilled, dramatically, in detail, and astonishingly fast! Viewed through the lens of Bible prophecy, the subject of global trade and commerce is riveting. But putting world events together with Bible prophecies needs to be more than just a rousing intellectual exercise. Seeing Bible prophecy fulfilled in such obvious and dramatic fashion ought to arouse curiosity in the Bible, in God’s existence and plan. It ought to stir us to action! If a trade war is looming, then don’t you want to know how to escape the destruction? You can be protected. Your family can be protected. You can be there to witness the outcome of the trade war and full-scale military conflict and to witness the greatest event to happen in the history of the universe: the return of Jesus Christ. What do you have to do?